CAN DOCTOR JAMES BURKE SAVE HER MOTHER’S LIFE? Melissa knows he’s the best surgeon at St. Joe’s—with the worst bedside manner. It’s a blazing hot summer, and hospital administrator Melissa Clayton is sweating over the chaos caused by the doctor’s job action, and the problems with her haphazard wardrobe. They take second place, however, when her mother needs heart surgery. 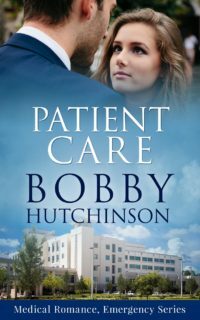 ˃˃˃ Surgeon James Burke is the man for the job, but his bedside manner could use more than a makeover. I was visiting a friend who worked at St. Paul’s Hospital in Vancouver one hot summer day. In the parking lot there was a mobile coffee stand run by a huge friendly guy who seemed to know everyone’s name. My friend had told me the doctors were threatening job action, and she’d also told me about a talented surgeon whose total lack of bedside manner drove the nurses nuts. What if the coffee guy turned into an unlikely Cupid, and the doc had to upgrade his bedside manner? A few more what if’s, and PATIENT CARE was born.